The second flight consisted of eight vintages of Vanessa/Birch Creek vineyard designates. The name change reflected new ownership, not a change in the fruit source. This is a Walla Walla vineyard, so no wine was made in the last freeze year, 2004. These grapes, noted Kurt, were usually harvested at higher brix than the Sundance fruit, and were fermented and aged in new French oak. As a result, they had higher alcohol levels and traded the Sundance minerality for a rich, buttery, roundly full-bodied set of flavors. Not one of the 16 wines was over the hill, though the Neocork wines (2004 Sundance and 2005 Ceres) were definitely oxidized. Still, in my opinion, drinking enjoyably. In both flights, I ranked the 2001s as favorites. The screwcapped vintages retained astonishing freshness. As with all Rulo wines, they showed immaculate winemaking and a fine sense of balance. “I hate marketing” Kurt emphatically states, and the Schlickers back up that statement with one of the more aggressive un-marketing campaigns in the state. 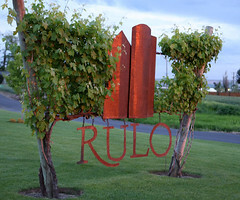 But Rulo belongs in the top ranks of Washington wineries, not only for the white wines, but also for the reds. Hopefully, a syrah vertical will happen later this summer. Meanwhile, here are my impressions of the first flight of chardonnays (I’ll continue the discussion on Monday’s blog). Just for fun, I put scores down, reflecting my assessment of their current drinkability. The freshest, saltiest, most intense of all. It bursts forth with sea breeze scents and rich minerality. The fruit is a synopsis of citrus, apple and fresh herb, and the balance is perfect. I appreciate Kurt and Vicki's non-marketing philosophy. They are truly focused on the wines, not hype or "rock-star status" promotion. Kurt is very modest about his craft, but I think he is far more talented and practices the utmost quality assurance than many of his peers. He uses 100% French oak and screw caps. I love that! Kurt has done his research on enclosures and although, I personally know people who won't buy (any) wines with screw cap enclosures are missing out on some of the best wines coming out of Walla Walla because of their own pretention and ignorance. I personally pick up a case or two every time I am in Walla Walla and this is always one of my favorite spots. I would love to keep them a secret, but can't help boasting about and sharing their wines every chance I get. I look forward to part 2 of your vertical tasting.